At the end of the 19th century, the businessman Pieter Hendrik Verbeek invented the first star with points attached to a metal frame. It could be assembled by sliding the paper points into the metal frame. This innovation made it possible to take the star apart and ship it. The Herrnhut Mission Book Shop served as the first distributor. The beginning of production is closely linked with the name of the tireless book and music publisher Pieter Hendrik Verbeek, who had been selling the first stars in his bookshop. Verbeek continued as partner of the star factory until his death. He was succeeded as director by his son Harry in 1925. The points were available in five colours (white, yellow, red, green and blue), allowing eleven combinations. The stars were available in two sizes – 56cm and 80cm. A wrought iron hanging bracket could also be ordered. Over the course of the following years, P.H. 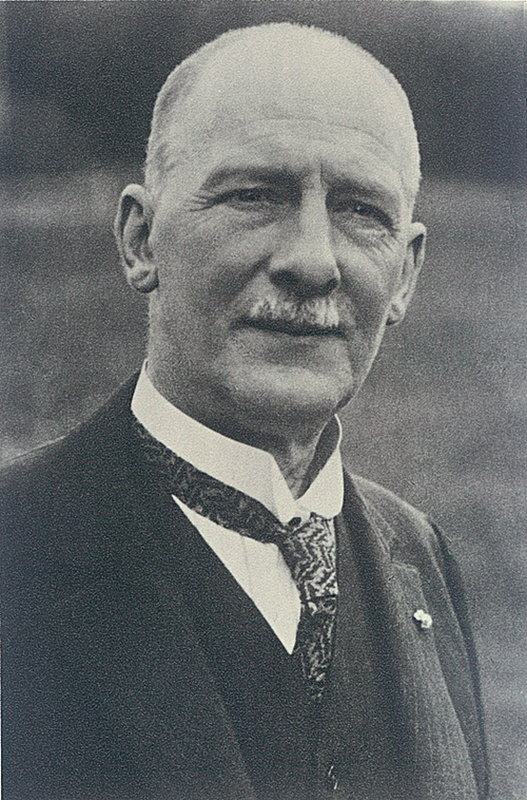 Verbeek developed the construction further and founded the “Stern Gesellschaft mbH Herrnhut“. 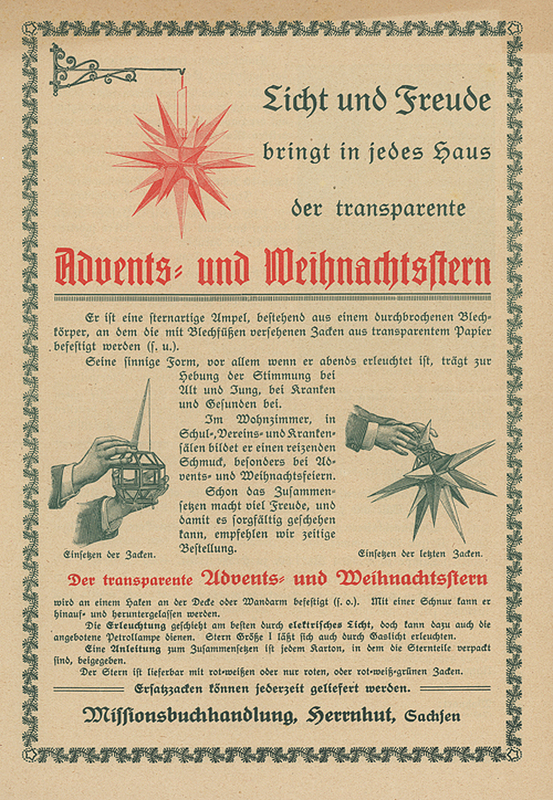 In 1925, he registered a patent for the first frameless Herrnhut Star. This model corresponds to the stars produced today: 17 points with a square base and 8 points with a triangular base. The self supporting construction made mass production, sales and delivery much easier and was a vital feature for successful world wide marketing. 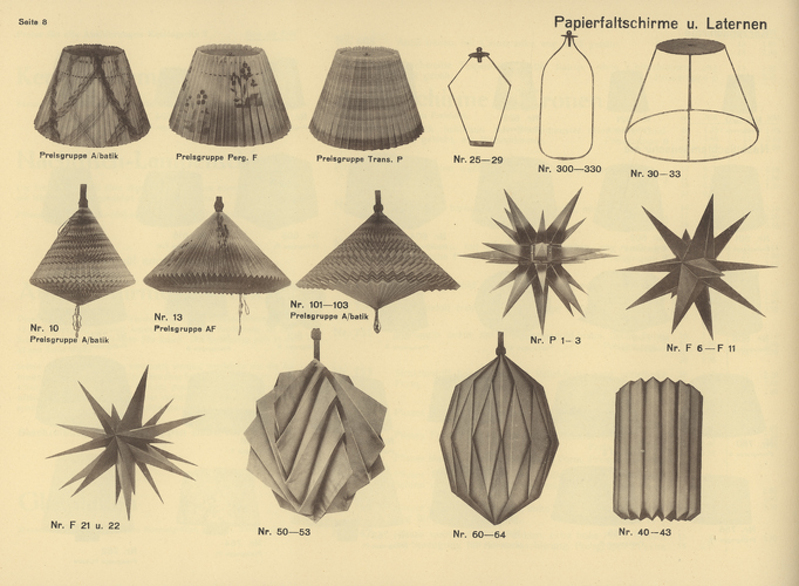 Advertisement for fabric lampshades: The great success of the fabric lampshades in the 1930s compensated the drop in foreign trade resulting from the political situation. In 1925 the “Stern-Gesellschaft mbH Herrnhut“ was founded by businessman Pieter Hendrik Verbeek, the mission department of the Moravian Church and the company Abraham Dürninger & Co. Thus began the eventful history of the current company Herrnhuter Sterne GmbH, spanning its nationalisation in 1950, followed by its denationalisation in 1968 and its relaunch in the 1990s. 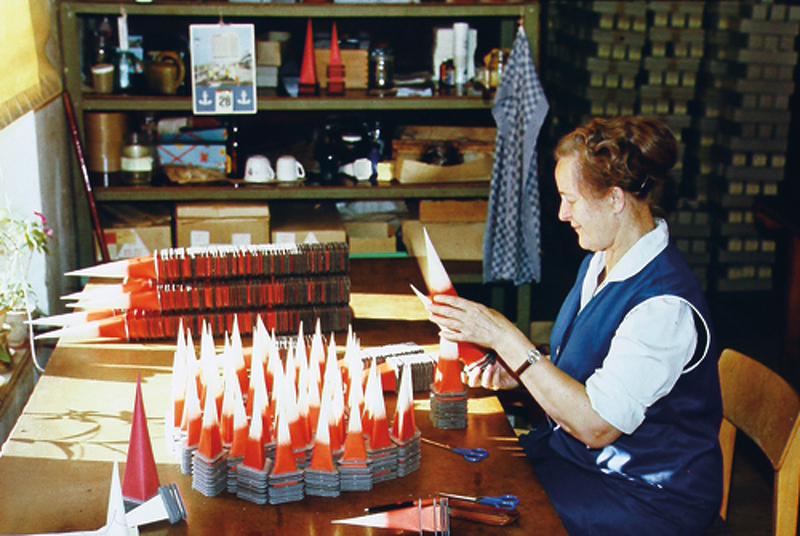 In 1950 the Star Company was nationalised and become the“People’s Enterprise of Stars and Lampshades of Upper Lusatia” in 1951. 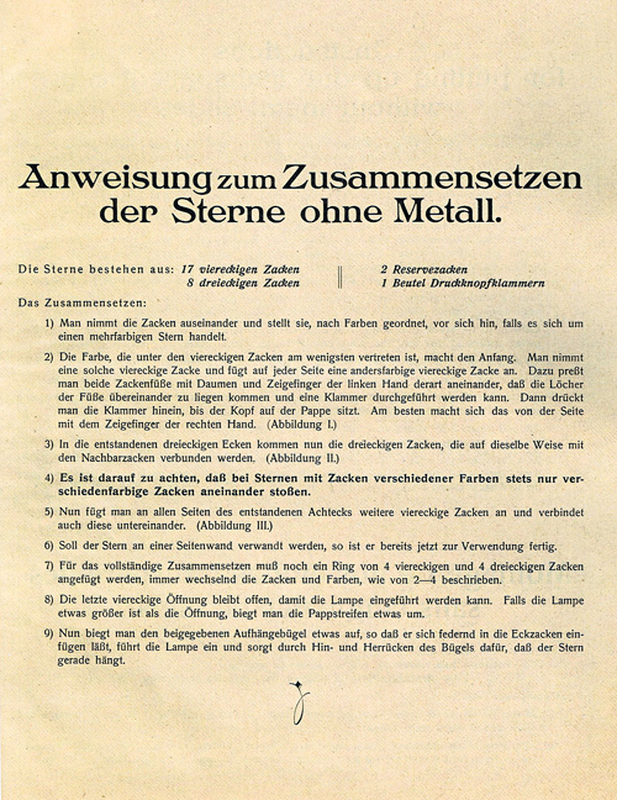 When hand production – particularly of stars – no longer fitted into the socialist ideal of industrial production, the decision was made to denationalise the company. To return the enterprise into the hands of the Moravian Church was an unusual action to take in those days. The business situation remained precarious and the new company continued to be subject to state production requirements. 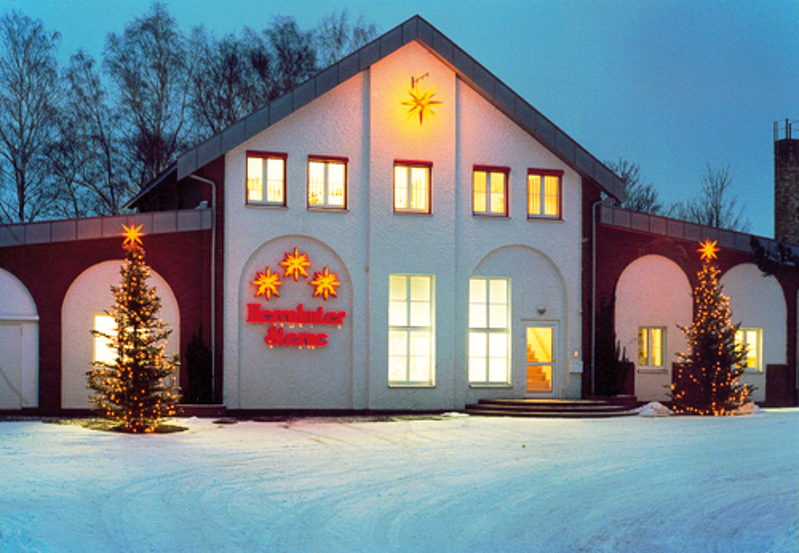 Herrnhut Stars, with the relaunch of the private limited company “Herrnhuter Sterne GmbH” employing 23 workers in 1991. The sales department needed to be completely rebuilt. In addition, new materials were used and the production process was modernised. 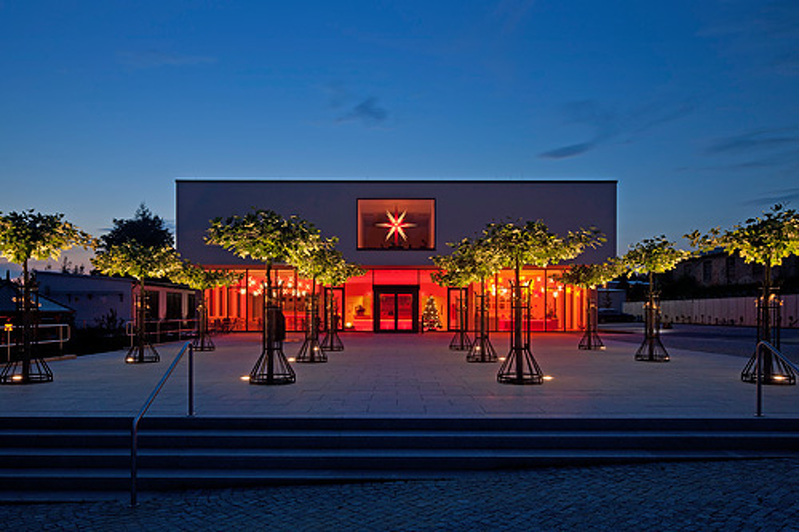 Since 2010, the production facilities and the Demonstration Workshop have been united under one roof at the new Manufactory. 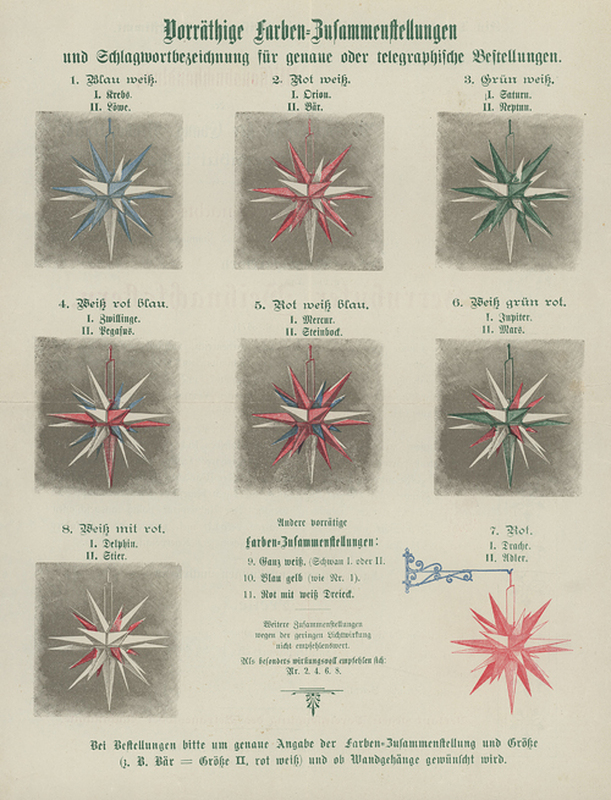 In the modern production rooms of Herrnhuter Sterne Manufaktur, you can see diligent hands folding and pasting the small and large points for the famous Herrnhuter Sterne, which even today are still handcrafted in the traditional way.